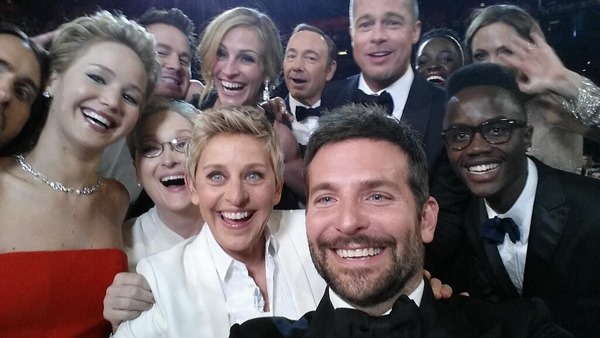 Samsung’s advertising machine was in full flow once again at the Oscars 2014 ceremony, and when a Galaxy Note-snapped picture by TV personality Ellen DeGeneres surpassed the record for most retweets ever in just half an hour, the marketing and PR department of the electronics firm must have felt as though they’d struck gold. 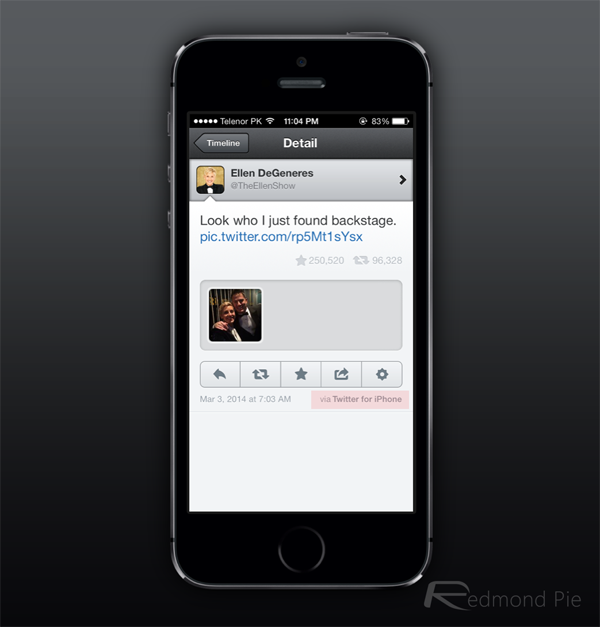 Yet, as ever at these kinds of events, the truth tends to reveal its ugly head backstage, and a later snap uploaded by DeGeneres via Twitter for iPhone suggests that, like a seemingly disproportionately high number of celebs, she’s in fact an iPhone user. Big tech companies regularly target the famous faces for a bit of promotional work, but while this simple scheme is a quick, effective way to get fans purchasing specific brands, things can often go horribly wrong. Ellen was spotted on-stage with her Note, leading us to believe that she was a genuine user of the Sammy phablet, but while that relentlessly retweeted snap was taken on the larger-than-life handset, she promptly ditched it backstage for an iPhone-blessed snap with Hollywood star Channing Tatum. Of course, it’s only a minor blemish on Samsung’s evening, which will still go down as a success as far as the Galaxy maker is concerned, but it does go to show that, more often than not, your favorite singer, actor or sportsperson is probably on iOS. Samsung has already been recently stung by German soccer messiah Franz Beckenbauer, who made the increasingly common faux pas of hashtagging about Galaxy devices right from his iPhone. Spanish tennis star David Ferrer waxed poetic about the wonders of S Health, but in doing so from his iPhone, exposed himself as a paid promoter rather than a legitimate user. And who could forget about Oprah? One of the most famous faces on the planet, she tweeted of her affinity to the Microsoft Surface, as well as her plans about picking up twelve units as Christmas gifts. Plausible enough, but, of course, she was tweeting right from here beloved iPad. So Ellen, you’re definitely not the first, and with the sheer amounts of money that Samsung is willing to plough into advertising, won’t be the last to inadvertently show your Cupertino stripes. Still, even though Samsung still had a good evening by all accounts, perhaps they should go about finding a celeb who also happens to be a huge Galaxy fan. There must be at least one out there! I am that fan 😀 Now a Galaxy S5 user (formerly S3) ..